Shown on one weekend only! 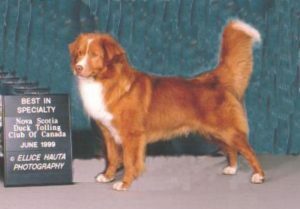 “THE DANCER” lived up to his name at the Specialty Show in Cloverdale, British Columbia, June 26, 1999, going Best of Breed over an entry of 122 Tollers to become the 1999 BEST IN SPECIALTY SHOW Toller. The Dancer was the greatest show Toller we have produced since Ch Crusader of Jeffery Coldwell, “Bigs”. 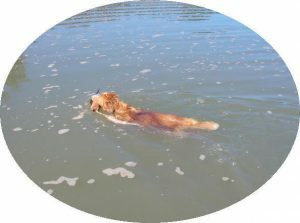 The Dancer like Bigs, (who sired a BIS toller), has been an important part of our breeding program, siring the greatest winning toller to date, (The Decoy Dancer). 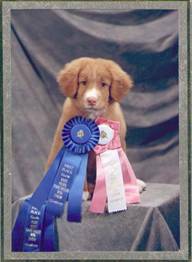 We wish to thank Leslie Rogers for recognizing the “Dancer’s” great qualities, as well as giving everyone at the 1999 Toller Specialty, the very best judging effort we could ever hope to have. 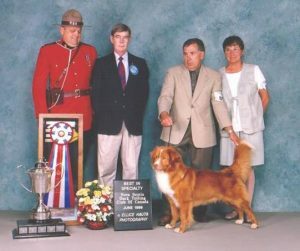 Congratulations to each of the winners and to all of the wonderful Tollers and handlers that participated. winning the 2004,2005 & 2006 AKC Specialty Shows and the 2005 CKC Specialty Show.